Hello Share Splurgers. The name Prairie Mining (PDZ) might give an impression that it’s a green company. Yet it deals in coal. But this coal is ideal for making coke, and from school days I think this is a cleaner alternative to the stuff we burned to keep the ‘frost flowers’ from the inside of our windows in the ‘fifties. Since I bought into Prairie in December, the shares have risen from 30p to 39p. Which is up by about a third. Not bad. But I have grounds for believing that the jolly action isn’t over yet. Luckily, Prairie was one of my Shareprophets tips for 2018 and I continue to have great faith in this lot. Coke is used to make steel. You’ll be aware that sales of steel, so depressed a few years ago, are making a comeback. It’s all this structural work being done by the emerging nations. As well as big projects in the developed world – including that big new rail plan here in Blighty. But that was known when I bought the share. What has given further impetus since then has been an RNS this month saying Prairie had been talking to a big polish miner called JSW. The idea was to co-operate, though this has yet to be confirmed. According to rumours, JSW might even buy Prairie’s coke mine in Debiensko – it’s valued at £350 million, but there’s no firm word from Prairie on this story. And also China Coal is also interested in Prairie. Enough, it seems to order a bankable feasibility study – once again China helps to boost a share price. I’ve not heard that either of Prairie’s two big mines are yet producing the black lumps in commercial quantities, but they will be doing that soon and, ok, investing in miners isn’t always hugely successful for private shareholders like us, but this one does seem to harbour the possibility of becoming a bagger of some kind (if all goes to plan). And now to the coal fire in the Punter’s Return. Fancy Doing the Okey-Cokey with a Miner Called Prairie? Hello, Share Sweetners. I rarely bring a developing miner to your further scrutiny. I prefer to leave all that to my mining expert colleague Gary. Also, I’ve been burned quite a lot by disappointing mineral and metal finds in the past. But any road up, let’s have a look at this one. Coke is used heavily by the steel industry. And we all know, from plant closures in the UK, that steel-making is currently not the most profitable undertaking in the world. There’s too much competition, including interest from our friends in China. But manufacturing, construction and heavy engineering all need steel, as does the car industry. So coke, which heats up the raw material, is always going to be in demand. Can you imagine, for example, how much steel will be needed for that new HS2 rail link? Prairie has a coal project called Debiensko, which in January will start producing a slightly lower grade coking coal than that of its other site, Jan Karski. The Karski mine is set to start producing next year also. Both locations are at the centre of industrial Europe and have excellent access to infrastructure. The reserves at both mines have been estimated at $3.3 billion. Which is big compared to the company’s present valuation. Though one should be aware that such estimates, especially in the mining game, can go wrong. Prairie shares are now just over 30p. In March they were over 40p. This is not one of those mining shares which aims to serve a market which may not be all that big. Coke is vital for manufacturing. There are signs that the developing world, especially, is going to be making and building many more machines, buildings and heavy plant. But, as with all miners, there just may be hidden snags along the way. And you should be aware of those risks. As we all are in the Punter’s Return. Hello Share Rattlers. Quite a few of my friends face a grim Christmas. They are undergoing radio and chemo treatment for cancer. Is it me, or is the number of cases growing even faster than normal? I am invested in a few companies that are fighting this scourge. One such outfit is Feedback (FDBK). This is a tiny Cambridge company (worth about £4m) which helps to diagnose cancer on computers. Its product is Tex-Rad, a software system that spots medical abnormalities on scans. These features are not always spotted by doctors because they are so small. The advantage is obvious – cancers can be identified at a very early stage when they are most susceptible to treatment. The professor behind the system tried it out on people with liver cancer and came up with results he describes as ‘quite remarkable’. Well, perhaps he would. But the fact is that the system interests hospitals in various parts of the world. Revenue is growing. However, the stock is not very liquid and the spread can be eye-watering. I’ve held my stock a long time and am still slightly down. The system has not yet received all the official go-ahead it needs. But it does expect to get a European licence. It hopes to get permissions in the first few months of 2017. I think we may see a placing fairly soon to raise money to commercialise the product. But you have to expect that with very small companies which find something which is potentially big. Soon the company expects to announce a new product which looks for evidence of tumours in the lung. This is probably not the safest punt in the world, but that is the nature of medical pioneers. And the rewards, both financial and the satisfaction of helping people who face serious ill-health, may be worth taking a risk for. Free Xmas drinks in the Punter’s Return tonight. There is a charge for the glasses. 1) Hello Share Crafters. In the past I’ve probably written too many pieces on a medical share which I like. During that period, I’ve seen the shares rise from 2p to 17p. Sadly, the share price has reversed back to 6.5p. And the worst of it is I bought a shedload more shares when they were around 10p. I refer, of course, to that darling of the bulletin boards Advanced Oncotherapy (AVO). I haven’t featured the company for some time now and it’s probably worth an update. OK, let’s look at the good bits about this interesting company. Advanced is convinced that it has the answer to a real – and it seems to me – a growing health problem.That is cancer and especially cancer in harder to get at areas, like the brain. It is working on a system which zaps cancer cells with proton beams. Other companies do this, too, but the advantage for Advanced is that its system will be much cheaper to run and take up less valuable clinic space. It is confident that it will be able to demonstrate a full scale prototype some time this year, before beginning commercial production in 2017. I’ve been hearing what the chief executive Dr Michael Sinclair has to say. He argues that the medics and scientists working on the project could all be doing something else in their chosen field. But they are concentrating instead on this proton beam zapper. He says, and I believe him, that they would not do this for a technology that was not absolutely worth it. He claims all those involved – and their names are well respected in the global fight against cancer – have one aim: to reduce the cost of treatment, especially among children. Probably to earn a little money for themselves, too, I expect. The company has completed a significant fund raise and has in place alternative routes to extra finance should it be desired. However, it is not expected to be needed. I have may have invested rather more than I really should in Advanced Oncotherapy. But it appears to be on track in doing what it has to do. So my money stands a real chance of doing the world a heck of a lot of good. 2) Hello Share Slickers. I’ve already featured the bulletin board darling, Advanced Oncotherapy (AVO) this week. But as I’ve currently spent a large wodge of time researching this interesting share, it would be a waste not to bring you a bit more info and opinion on a stock which has risen like a rocket and fallen like a brick. I think that fall has been overdone and punters are possibly waiting in the wings for a bit more news before they return to the stock. That’s the trouble with Advanced as far as I can see. News of late has been thin on the ground. And when now’t happens there is normally a decay in share price. The company is expecting to deliver ‘news’ during the third or fourth quarter of this year. It presently claims that the cost of its proton beam cancer treatments are a fifth of some other proton machines. They will also take up far less room. And Advanced also makes claims in two other areas. One is that its system is very precise. This means that cancer cells can be targetted, while cutting down any damage to healthy cells around the tumours. Another important area of benefit – and I don’t think I’ve mentioned this before – is one of safety. The prototype will be installed in Harley Street, the medical centre of Britain. It will not be bunkered in a remote location, which is required by some other existing devices. Advanceds proton beam system will not just be weighed against existing proton beam machines, but should also be able to replace existing x-ray treatments. Some of these around the world are rather antiquated now and so safety becomes paramount. The size of the cancer treatment industry is huge. Advanced says it hopes to gather to it 10-15% of that market in the next 10-15 years. Also, though it is a relatively small company, it has some big partners in the med-tech industry and they will not want it to fail. However, and I can’t stress this too strongly, Advanced is a pioneer and investors must be aware that risks usually accompany pioneering ventures. That’s what we say in the Punter’s Return. Hello Share Swingers. A little miner called Tertiary Minerals (TYM) has graced my modest blog on Shareprophets before now. In the past, it’s been a big winner for me. I well remember being at Tom’s pizza emporium helping to prepared hand-outs for the big 2014 UK investor Show when I spotted on my laptop that Tertiary shares had been moving ahead from 7p to 12p. I asked Tom’s advice – as one sensibly does when he is on the bridge – and he said sell ‘em. (Well, I rather think he did, as we were both distracted at the time.) Anyway, just before the Stock Exchange closed and in the last day of the financial year, I hit the sell button. And that advice turned out to be very sound indeed. Because after that, Tertiary Minerals hit a consistently downward slope. I bought some more when it hit about 6p, expecting the usual rally. But then came the commodities crisis, and most miners took that big hit, which remains with us to this day. However, Tertiary Minerals has had good news of late and the share has been putting on weight. Of course, the share price is so low now, that I am still running at a loss on my second acquisition. But given the importance of what it produces – fluorspar – I rather think the upward splurge is not yet over. (Tom Winnifrith wrote recently that there could be another placing in the offing and therefore is not supportive. Fluorspar is used for many applications, including iron smelting, steel and aluminium products, glass things. toothpaste, telescopes and Teflon which stops your eggs sticking to the frying pan.Tertiary Minerals (TYM) is the only listed fluorspar company based in the UK. It has three sites where it hauls the stuff out of the ground. All mining shares have to be treated cautiously these days, but it seems that Tertiary has dug out a niche for itself. The company issued a drilling update this week about its MB project in Nevada. The JORC (Joint Ore Reserves Committee) estimate for the site grew to 86.4 million tons last year. According to the management, the size of that deposit continues to grow. The little miner also has two big projects in Scandinavia, and there was more bumper news this week when the Swedish authorities gave the green light for a mining operation in in that beautiful country. Little of the potential of these projects seems to have found its way into the share price. We can’t live without Fluorspar, they tell me, so my Tertiary shares are staying in my bag for the time being. While I’m staying in the Punter’s Return. God bless. I can’t exactly remember which New Year shares I tipped last year. But I recall that one of them Zytronic (ZYT) which does wonders with touch technology, was a cracking performer – I got a gold star for it in the performance table! Though another share I’ve drawn your attention to quite a lot has had a more up and down career. I bought Advanced Oncotherapy (AVO) at around 2p and it’s about 7p now. But so far, I’m losing quite a bit of dosh on it. That’s all because of that fateful trip I made last April to attend the wonderful UK Investor Show in Westminster. As the train ride progressed, I bought a load more AVO shares. then noticed that the share, which had snowballed all week, was now approaching 17p. I was about to sell at this point, because such a huge jump is rarely sustained. Then I lost radio signal. By the time I regained it, the stock had begun a slow journey down. Reasoning, daftly, that it would get a second wind, I hung onto the share. So now I am adrift by quite a bit. And yet there has not been any spoilers to squash Advanced’s progress. It’s just that little good news has come through, either. That doesn’t worry me, because with a new technology which is, really, really useful – like zapping cancer tumours – the orders are bound to flood in eventually. But will the technology, which is based on discoveries at the Hadron Collider project, come to full fruition? Well, a lot of people think so. and I’m told the efficacy of the treatment is already more or less proven. So if better news comes in 2016 expect that fickle share price to hit 17p again. That would make it a two and half bagger by my reckoning. We’re good at maths in the Punter’s Return. SHARE ATTACK – 80 great tips to survive and thrive as a trader. 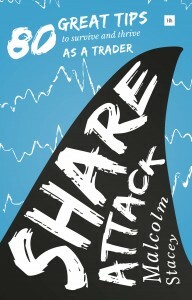 Published by Harriman House, Share Attack is the latest book from share author and former BBC journalist Malcolm Stacey. Simply click on the cover image to go to the Harriman House website for more info. Our readers can take advantage of a unique offer from us. Order Share Attack and enter the following codes to receive 25% discount from RRP. Hello Share Folk. I’m going to the hospital today to see about my prostate gland. I started the routine tests a few years ago and have been under the eye of a brilliant consultant ever since. There’s a lot of debate of whether we should have these tests done, as it causes a lot of anxiety and their reliability is not always that great. On the whole I would suggest you do have them done, if you’re of a certain age. But what do I know? The visit to hospital confirms my view, though, that there one thing more important than the health of our shares – and that’s the health of us. Your shares can drop like a lead-studded anvil down a coal shaft, but if we have good health, collapsing stocks are, in comparison, not in the least bit disturbing. You can combine the two concerns of course by buying shares in companies, which push forward the frontiers of medical science. You may recall that I’ve invested big time in three life science firms – Feedback (FDBK) Avacta (AVCT) and Advanced Oncotherapy (AVO). Now at first all three stocks shot ahead. But in recent months there has been a bit of decay going on. This is not unexpected. Whenever you get a penny share, which looks really promising, there is an army of chancers out there who will take a punt just because the stock is rising like a discarded champagne cork from a submarine. But when the momentum – usually set off by a single piece of good news for the company – winds down, the same army of opportunists sell again. This dumping continues until the next piece of good news. In the case of all three aforementioned shares, the future outlook is no less rosier than when I first bout their prospects to your attention. So I expect good news to keep spewing forth as the months, and indeed years, roll by. Then the army of chancers will turn up again and the share prices will hit mew highs once more. (Though I cannot be certain). But I’m an optimist, as you know, so you must make up your own mind. See you in the Punter’s Return tonight? Malcolm Stacey of ShareProphets – Feedback PLC, Don’t You Hate the Small Profit-Takers? Hello Share Bunnies. There was some interesting share movements after all the good news came out for Feedback (FDBK), the minnow capitalised at a mere £5 million. This firm which makes software to help in assessing cancers and other serious illnesses has been recording some big progress. The latest news to come in was that the National Health Service’s research arm has produced ‘an alert’ to the affect that this company is worth looking at. The share price put on 15%. It kept that level for most of the morning. Then the price began stepping up. There were small twitches until the golden share reached nearly a 50% rise on the day. This put Feedback at the top of the overall winners board. But not for long. The zenith proved to be a spike and the share inched down again to end the day at just 15% up. I checked the number of buys and sells throughout the day, and at no point did purchases exceed the sales. This rise and fall pattern is so common for penny shares these days. And I think we all know what’s going on.There is a large army out there who will take a profit, no matter what the great future might lie in store for the company. Feedback may not yet have recorded a recent profit, but it already nets £300,000 every 6 months by way of royalties and as their software is so desirable to find and treat serious cancers, I cannot see it failing to be a tasty go-er in the near future. Yet, so many holding the share are willin to take a short term profit. And they do that even though the spread is, as I look now, 20%. I think such short-term strategies are a mistake. They won’t realise much cash, because I notice the parcels of shares sold were largely tiny, many under £300. This could be a multi-bagger. I’m not daft enough to say that’s certain, or even probable, but I’m buying the shares and staying in for a few months at least. But what the heck? They say it’s never wrong to take a profit, and that does take a bit of arguing against. But personally I prefer a big profit to a small one. Time now for sampling duty – at the Punter’s Return. Hello Share Thrashers. It’s not my custom to return to promising shares I’ve brought to your attention in the recent past. I normally wait at least six months or so – with only a few exceptions. But the story is growing fast for one bio science company that I’ve featured quite recently – Feedback (FDBK). I’ve had one or two scares with the old prostate gland. My father died of prostate cancer and it makes my very nice consultant a bit wary. So I was interested to learn the very latest RNS from Feedback. The company has formed a 50-50 alliance with a big Valencia company which is also in the field of diagnosis of serious illnesses. The name of this new set-up is Prostate Checker. Now I happen to know, having an prostate family history, that cancer of this prostate can be serious or non-serious. This new link up between Feedback technology and the Spanish company should make spotting that difference easier. I probably don’t need tell you how common prostate cancer is. A couple of years ago, Uncle Tom grew a funny moustache to emphasise the point. So this technology will probably interest many consultants and hospitals around the globe. A study of 100 prostate cancer patients by the University College of London has already demonstrated the ability of Feedback technology to differentiate between significant and not-so significant cancers. The shares are still not at their year’s high of 3.20p, but a few tidy jumps over the last two weeks means we could be getting there. It doesn’t look to this old punter that the market has woken up to the fact that the technology, known as TexRad, is so useful. Obviously, if surgeons can identify the stage of cancers more easily, the treatment will be more specific and thus more effective. This is an important medical advance, and worthy I think of my punting money. As always, though, gang, we must bear in mind that medical pioneers can be vulnerable to competitors and regulations. So not for the more cautious share-shifter. And now it’s back to the Punter’s Return.